Wash the beans, remove any stones or specks you see in them and wash them to remove any dust. Put them in the pot where you plan on boiling them and add 4 cups of water. Place them on the stove to cook and when they begin to boil (in about 10 minutes), turn off the stove, cover them, and let them sit for about an hour. Once the hour has passed, strain the beans using a colander then place them back in the original pot and add 8 cups of water. If you are using a pressure cooker, be sure to close it properly and follow all safety instructions. Set it to high heat and when it starts to whistle, lower the temperature and let it cook according to you pressure cookers instructions, this depends on the type of bean as well (black beans cook much faster than the pinto bean for example). In my pot, pinto beans are ready in 25 minutes. If you prefer to use a regular pot, add beans, the 8 cups of water, and let boil until cooked (2-2 1/2 hours), the time cooked will depend on the bean, these beans are cooked uncovered and the water evaporates, check on them a couple of times to make sure they have enough water. If necessary, add water, but be sure to adjust the heat so as not to interrupt the process. When the beans are ready (if using a pressure cooker, be sure to follow safety instructions), put them over medium heat, and add onion and salt. Let boil for five more minutes. Serve in bowls, sprinkle cheese on top and enjoy! If you like your food to be a little spicy, feel free to add some chipotle when you salt your beans. When you buy cheese, take a piece and crumble or grate it and leave it in a plastic container so it’s ready for you to use. If you cook the beans the day before you plan on using them, they’re likely to be thicker on that day. You can add a little bit of water to break the density. 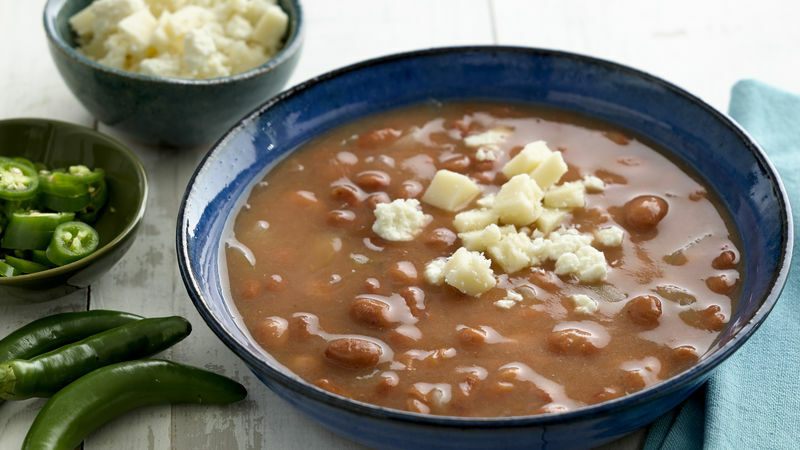 Beans are definitely a quintessential Mexican flavor. Their variety and texture make them an ideal food to combine with many other dishes. I can honestly say, without exaggeration, that I have eaten beans at least 5 days a week for all my life. In Mexico I ate a lot of flor de junio and flor de mayo varieties, while in the States I grew accustomed to pinto and black beans. I love adding them to salads, soups, and chili. But they also make great additions to dishes like sopes, tostadas, tacos, and more. I still prefer to eat them on their own, with cheese on top and maybe some sauce on occasion. Best of all, beans are extremely easy to prepare, super economical, and a great way to satisfy the family. How do you prepare your beans? There are several ways to cook beans, but the two most common are in a pressure cooker or a regular pot. I like to use the pressure cooker because it saves me time. In this recipe I give you both options.